Looking back at major outbreaks of UFO activity always has a dream-like effect. In later years it becomes hard to believe that perfectly ordinary parts of our world can be swept up in a frenzy over unusual activity, bordering on hysteria. Perhaps for this reason, the Spanish-speaking countries have used the term “psychosis” to characterize the atmosphere surrounding a saucer flap, for example. The image that best characterizes this is the tabloid cover photo of a police officer and a knot of teenagers looking up at the night sky, with the screaming headline “¡platillera psicósis!” referring, in this case, to the 1991 UFO events in Mexico City. Similar circumstances occurred in Puerto Rico, an island known for its heavy UFO activity, usually centering on two specific areas: El Yunque Rainforest in the northeastern corner of the island, within a stone’s throw of the capital city of San Juan, and the island’s southwestern corner, where unusual events centered around the communities of Cabo Rojo and Lajas. Unidentified flying objects had made themselves at home in the Seventies, resulting in localized “flaps” the received worldwide attention, and even prompted politicians to call for an official study into the nature of the phenomenon. The leading theory explaining the recurrent UFO appearances over that particular zone involves the unusual magnetic fields found in the vicinity of Maricao State Forest, which has been a notorious materialization point for unidentified vehicles over the years. Laguna Cartagena is in the state forest's vicinity, and excessive interest in Laguna Cartagena prompted police and Civil Defense authorities to cordon off the area and have discouraged investigators from visiting the area, citing "disruptions to the lagoon's fragile ecology". The southwestern corner of the roughly rectangular island has for centuries been the stage for paranormal events. In the 1600, the Blessed Virgin appeared in the town of Hormigueros, where many Lourdes-like cures have taken place; in 1953, a boy named Juan Collado had been visited by an entity claiming to be the Virgin, who instructed him to tell his parents and other adults that she would re-appear near a well on a given date. Thousands of people from around the island flocked to the site of the "miraculous" well, standing in hurricane-season rain to wait for the Blessed Virgin to appear. The situation, reminiscent of Fátima in 1917, led to many sudden healings, and although there was no "miracle of the sun", many observed a glowing UFO land upon a hill not distant from the well. In spite of the torrential rain, the UFO managed to set the dense tropical vegetation on fire. In 1974, a UFO flap coincidental with the wave taking place stateside produced hundreds of sightings, abduction reports, mysterious human disappearances, numerous mutilations of cattle and, oddly enough, the Blessed Virgin staged a reappearance, producing more miracles. The Eighties, however, were quiet – a silence that was in step with the lack of UFO activity worldwide – and many researchers who had been active during the previous decade returned to “civilian” life. An incident in Cabo Rojo on May 31, 1987 served as the metaphorical starters pistol for the resurgence of a decade of UFO and paranormal activity in the island. Puerto Rico’s south-western coast was rocked by an explosion and an earthquake at a reported depth of some 80,000 feet. Witnesses reported plumes of bluish smoke emerging from cracks in the ground along with a series of aftershocks. Seismographs soon issued conflicting reports: originally, the tremor’s epicenter was under Laguna Cartagena at a depth of 8000 feet. Later, it was moved out to sea, somewhere in the Mona Passage. Whatever the strange objects in the sky were, and whatever unexplained intelligence was behind them, returned to the scene with an intensity that exceeded earlier flap events. The phenomenon was now chronicled in the press – daily papers and specialized publications alike – and recent sightings, encounters and abductions competed for space with older stories that could now finally be told as experiencers felt encouraged to share them with the public. And some of the newer cases were mind-boggling: jet interceptors absorbed by menacing, behemoth triangular craft, the whereabouts of their pilots unknown; diminutive humanoids reported at road crossings, streams, beaches and -- most disturbingly -- bedrooms; rumors of an increase in activity by U.S. military personnel and Federal agents aimed at maintaining a “cover-up” merged seamlessly with intense official action against native terrorist groups (the so-called “Macheteros”) creating a palpable atmosphere of excitement tinged with fear. These spectacular (and admittedly questionable) events, however, could not compare with the aerial phenomenon supposedly seen in the night sky over the town of Betances and over the Sierra Bermeja region. Well over 100 witnesses on the evening of December 28, 1988 were treated to the sight of Navy jets, allegedly F-14’s, manoeuvring around a mammoth triangular UFO shaped like a guitar plectrum and with blinking lights. Harassed by fighters diving and spinning around its massive structure in an effort to force it down, or else follow a given trajectory, the giant UFO turned around with uncanny ease as one of the jets blocked its flight path. The massive intruder remained motionless, suspended in mid-air, like something out of a high-budget science fiction thriller. What happened next is unclear, but there is unanimity among the witnesses that the whine of the F-14 Tomcat’s engines was extinguished after closing in on the floating UFO. Whether it collided and disintegrated, or whether it was absorbed or “captured” by the UFO is unclear. The second interceptor vanished as well. The colossus then proceeded to split in two ) and each half took off in a different direction, one toward the southeast and another toward the northeast. This case was vividly described by Wilson Sosa, an onlooker turned researcher, before the those gathered at the 1991 International UFO Conference in Laughlin, Nevada. Officialdom did not delay in offering rebuttals about the strange going-on in South-western Puerto Rico. Aníbal Román, Civil Defense Director for the Mayagüez Region, reassured the population over a radio broadcast that neither UFOs nor strange lights were being seen in the south-western corner of the island. A vast effort was undertaken to demonstrate that the “cause” of the lights seen in Laguna Cartagena was attributable to lights of the Candelaria neighbourhood of Cabo Rojo reflecting upon the lagoon’s waters: The Puerto Rico Electric Power Authority (PREPA) left hundreds of homes without electricity for thirty minutes on October 2, 1991. Ramón Montalvo, an engineer at the PREPA plant in San Germán, claimed that the unusual lights vanished from the darkened sky “the minute the power was cut off.” Lt. Rafael Rodríguez of the Lajas police argued that the blackout proved the lights believed to be UFOs were merely the reflections on the lagoon’s surface. Although authorities went to the extreme of placing a series of large reflectors on the crest of Mt. Candelaria, the experiment was an abysmal failure: no-one saw the expected reflections, despite the official affirmations. Any individual armed with a map could have told that the lights of the Candelaria neighbourhood (20 miles away) could not possibly account for the situation being experienced on an almost daily basis by the residents of the Lajas Valley. In late January 1994, a Californian cable TV crew visited the island to prepare a documentary on the strange goings-on that had caused such sensation in earlier years. The crew, led by interviewer Tom Zennes, spoke to Israel Acosta Meléndez about a sighting occurred on January 16 of that year. Acosta claimed that he and a group of friends had seen a large blue light illuminate the night sky near Lajas, adding that the light remained at some distance above them for a long time before taking off toward an unknown destination at high speed. Acosta told Zennes that he had also had the opportunity of witnessing a circular, brass-colored vehicle that crossed the sky from Lajas to Cabo Rojo. The object had at least a dozen lights running along its sides. The Lajas resident had grown accustomed to these sightings and felt no fear of the unknown objects, although the same couldn’t be said for his trusty horse. He recalled heading for Cabo Rojo on horseback one day when he saw a UFO hovering briefly on the horizon before splitting into three parts. Acosta’s mount was so startled it nearly threw him off the saddle. On November 27, 1994, a UFO described as having a triangular shape crossed the heavens at 5:00 p.m. witnessed by Aracelis Valentín, a resident of Mayaguez's Jardines Housing, who was "astonished" by the sight. Mrs. Valentín explained that the UFO, which was "shiny and metallic," moved south from a northwesterly direction. "I was there with my 2-year old son, when I saw an object resembling a stingray," Aracelis averred during an interview with a journalist. She pointed out that the unknown vehicle was very large and clearly visible in the clear skies. As in other UFO cases, the craft allegedly sighted by Mrs. Valentín made no sound whatsoever. She insisted that it could not have been an airplane, helicopter, or balloon, since the object in question was incredibly bright and moved at a breathtaking rate of speed. "The phenomenon frightened me considerably," she told reporters from a local newspaper. One resident claimed to have seen the triangular UFO vanish rapidly, heading southward from the North. The object itself gave off a brilliant light and flew at a low altitude, which enabled the witness and three relatives to see it clearly. "At first I thought I was seeing white pigeons flying in formation, but I later realized it was something none of us had seen before," said the witness, a government employee, who insisted on anonymity when interviewed by reporter José Victor Jiménez. "I don't want my sanity called into question, but my immediate family and other neighbours saw the very same thing." The regular sightings were a certain omen that the sightings were coming back with renewed intensity, with regular reports appearing throughout the Christmas holidays and into the new year. World attention was suddenly thrust upon Puerto Rico again on May 6, 1997, when reports of a UFO crash near the town of Lajas (famous for the Laguna Cartagena incidents in the late 1980s and early Nineties) at 3:25 a.m. erupted on the news wires and on the Internet, producing renewed interest in the island's UFO landscape. All accounts coincided on the fact that something had happened near Lajas, producing an intense brush fire in the habitually arid region, but the source of the fire became a bone of contention: one band of ufologists claimed that a spacecraft had hurtled out of the sky and exploded, causing the conflagration, along with reports of Federal agents who denied the local police access into the area. Another ufologist appeared on television denying that there was anything to the event aside from a meteor impact which triggered the fires, and suggested that the celestial event was being manipulated by a band of government-infiltrated saucer fanatics to discredit UFO research on the island. To everyone's surprise, an astronomer took the side of the pro-UFO faction, insisting that a meteor of that magnitude would have left a tremendous crater, possibly obliterating Lajas and the neighboring towns. On May 7, 1997, Univision's Spanish-language Primer Impacto program presented a dramatic roundup of the events surrounding the mysterious Lajas incident: the interviewers reported claims that the Army had reported to the area to collect debris from the impact site and that the consternation among the locals was clearly visible. It was also pointed out that unusually heavy UFO activity had been reported over Puerto Rico's southern tier, and that a woman from the city of Ponce had taken a video of a silvery, rhomboidal object crossing the skies. Lucy Guzmán, an investigator affiliated at the time with the Puerto Rican Research Group, based in Hato Rey, P.R., posted a radio news story to the Internet which indicated Lajas mayor Marcos Irizarry's belief that the explosion and subsequent fire had been caused by U.S. military experimentation in the area. Irizarry added in the newscast that a growing number of local residents were coming forward with accounts of a glowing object that fell from the sky, and that three distinct explosions had been heard. An area radio station also experienced technical difficulties shortly after the detonations occurred, suggesting the possibility of EMP (electromagnetic pulse radiation). The defunct San Juan Star (the island's only English-language newspaper at the time) briefly mentioned that one resident, Francisco Negrón, said the fire burned with an unusual redness, which almost bordered on the supernatural. Tipping its hat toward the non-meteoric theory, the U.S. Coast Guard suggested that "an airplane crash" may have occurred at that time. An interesting feature appearing in the distinguished Bulletin of Atomic Scientists (May/June 1997) discussed an interesting addition to the U.S. nuclear arsenal: the earth-penetrating B61-11, a twelve-hundred pound warhead that replaced a number of older nukes. Whereas older nuclear devices had to delivered by a bomber due to their considerable weight, the lighter B61-11 could be dropped by a jet fighter. Capable of perforating the ground, this improved weapon of destruction employs "ground coupling" to produce a shockwave capable of demolishing subterranean facilities. While such capabilities may have called for by military planners bent on destroying superhardened Soviet command posts deep under ground, the end of the Cold War and the standing down of forces on either side has made such a sophisticated weapon redundant. But in spite of this lowering of tensions, there were tests of earth-penetrating nuclear warheads in 1988 and 1989 having far greater yields than required. Could the UFO enigma play a role in such an arbitrary decision? UFO investigators have repeated their belief that a subterranean "base" of some kind exists in the southwestern corner of Puerto Rico, either in the vicinity of the Sierra Bermeja mountains or offshore. These assertions have been generally supported by the considerable number of UFO/humanoid sightings in the region. Spurious maps of such an underground base (staffed by a joint complement of humans and aliens, as in the best tradition of early 90's "Dulce Base" accounts) were even circulated, showing underground "saucer hangars" and a submarine inexplicably "parked" in an underwater cavern. The article in the Bulletin of Atomic Scientists, which pointedly described the B61-11 as a "mystery weapon", indicated that planners have actively considered the use of small "dial-a-yield" warheads against Third World countries, particularly in their ground-penetrating capacity. Could we speculate that Puerto Rico may have proven an interesting test site, not only for its unique position, straddling the First and Third Worlds, but also for the perceived problem that hides beneath it surface? Saucers or no saucers, it is a fact that thirteen Puerto Rican military facilities (the number has gone down in the past years due to base closings) have been used for the storage of nuclear weapons ranging from underwater demolition mines to more sophisticated nukes -- all of them under the generic cover of Advanced Underwater Weapons (AUW). This situation is explained in William Arkin and Richard Fieldhouse's masterful Nuclear Battlefields (Ballinger, 1985). Even though the island falls squarely under the jurisdiction of the Treaty of Tecamachalco, which declared the island a "nuclear-free zone" along with the rest of Latin America (a special protocol of this treaty deals exclusively with the Puerto Rican situation). Antisubmarine bombers, armed with nuclear weapons, had made use of the defunct Roosevelt Roads Naval Base during wartime as their base. While la zona suroeste of the island commanded the lion’s share of ufological and media attention, a fascinating sub-plot was taking place at Puerto Rico’s heart, where the arid Caribbean environment gives way to sharp, verdant peaks. The mountain community of Adjuntas, part of the island’s coffee-growing belt, had attracted the attention of mysterious lights for decades. A 19th century town with a population of 35,000 scattered throughout the surrounding municipality, is located to the northeast of the city of Ponce, following the tortuous curves of Rte.10 and the narrow defiles on each side of the road. A community firmly rooted in the culture of Puerto Rico’s central mountainous region, it is largely known as a coffee-growing region. It is a little known fact that during the 1870’s, the island’s coffee was the most prized variety in the world, far exceeding the beans supplied by Brazil or even the Far East. The café society of 19th century Vienna was fuelled by coffee beans harvested in central Puerto Rico. “Adjuntas is a little town in the Central Range of Puerto Rico, and at this moment, we are very intrigued by some unusual events that are affecting our daily lives. Some years ago, we noticed the presence of Unidentified Flying Objects (UFO) in our skies. At first, we did not give great importance to this matter, but lately these things have appeared again and our citizens are distressed over this. Many, many persons have witnessed the presence of these objects in our surrounding space (evidence of these apparitions is included). 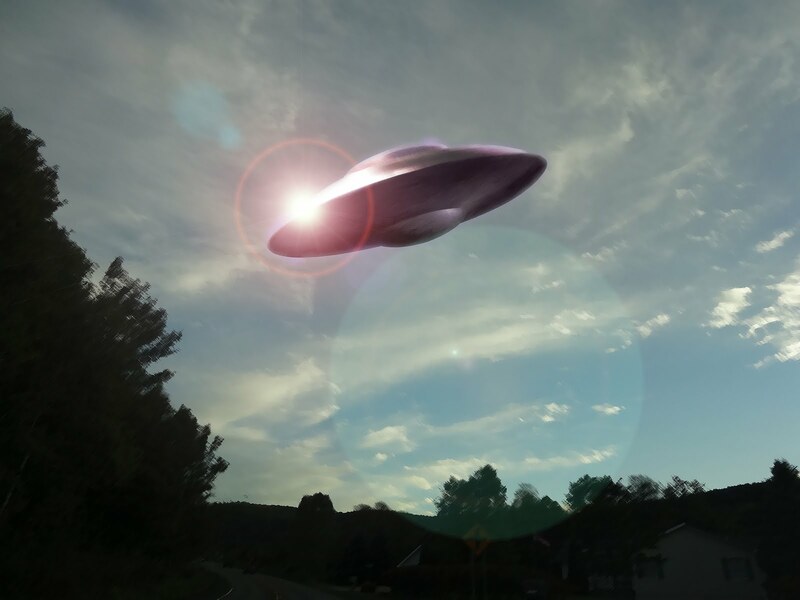 Interestingly enough, another mayor of Adjuntas had had his own UFO experience: In October 1972, Roberto Ramos, had his own sighting of unidentified aerial vehicles one night in the Barrio Garzas section of his community. A disbeliever of such manifestations, the mayor actually prided himself on his utterly rational approach to anything vaguely inexplicable. But sitting in the front passenger seat of a roofless jeep, along with other passengers, he was left speechless when three disks crossed the firmament right over their car. Ramos would later describe the objects as a trio of light-emitting disks, changing colour and intensity as they crossed the sky. As they flew overhead, there was no doubt in Mayor Ramos’s mind that he had witnessed an unexplained phenomenon. In November 1992, journalist Julio Victor Ramirez reported on a fascinating – and frightening – incident in the mountain community: uncommonly large luminous objects were reportedly descending on a hill known as El Gigante in the precise sector of the municipality where the mining test pits were located. The witnesses to the event included members of the local police department, who would subsequently retell the experience to radio personality Edwin Plaza: “That thing had a set of lights beneath it, and a white ray of light issued from its bottom, lighting up the hill.” Despite its tremendous size, the vehicle made no sound whatsoever. According to the law enforcement agents, the massive luminous object had appeared in the early hours of the evening, bathing the slopes of El Gigante in white light. The unknown object reportedly had lights underneath it and the source of illumination came from a single beam projected against the hillside. What made this sighting interesting – as if its magnitude were not sufficient to make it important – is that the object’s beam was apparently seeking a particular location: an agricultural school on the slopes of El Gigante that looked into “improved cattle ranching techniques”. With what we know about the presence of the UFO phenomenon in the world-wide epidemic of cattle mutilations, is it unreasonable to suspect a connection in this case? Within a few years, the UFO sightings in Adjuntas would give way to the earliest reports of the paranormal predator known as “el Chupacabras” in the mountain municipalities of Orocovis and Morovis. Unusual activity in Puerto Rico remained steady even as the Nineties gave way to the first decade of the new century, but never again reached the fever pitch of the 1987-1997 period. Using past performance as an indicator, there will certainly be similar bursts of activity in the future, but as always, specifying the exact moment is an elusive art. The UFO situation on the island during the Nineties, however, differed significantly from all the past waves by a significant new addition: the role of “alien abductions” and the appearance of the diminutive “Greys” instead of the taller, more clearly humanoid-looking aliens of decades past, conforming to a worldwide pattern. Although significant cases were reported during this period, the abduction phenomenon did not reach the magnitude that it achieved on the mainland U.S. or elsewhere. In retrospect, there appear to have been more encounters in broad daylight (or even moonlight) with non-human entities than bedroom visitations. The start of the Chupacabras mutilations effectively ended the initial “phase” of abnormal activity, and few if any UFO reports were collected during this period – a fact that repeated itself in Mexico in 1996, with the onset of mutilation activity in that country. Perhaps the most salient feature of the Puerto Rican wave of the 1990s was the amount of domestic and international media coverage it received. Local researchers were interviewed by news outlets from Spain, the United Kingdom and Japan (NHK television produced one of the most complete documentaries ever on the subject) and hosted visits by Stateside personalities such as Jacques Vallée, Linda Moulton-Howe and Timothy Good. Less fortunate, perhaps, was the trivialization of the UFO/paranormal events by commercial interests.